Maurice has been an active member since 2012. He has taken on the role of Chairman of the Finance Sub-Committee that oversights all financial aspects of the WMA in particular the Pirates Tavern. 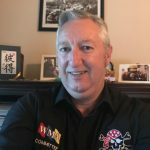 He is also an active member of the Williamstown Historical Society in the capacity of Treasurer and Treasurer of the Western Suburbs Badminton Association. Maurice has a wealth of experience in various Management and Consulting roles in private and government organisations.